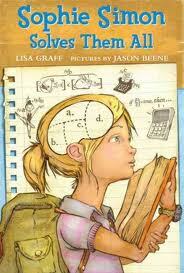 Ms. Gelson is currently reading Sophie Simon Solves Them All, a novel by Lisa Graff. Illustrated by Jason Beene. Our class has been quite intrigued by the character, Sophie Simon. Her parents absolutely do not understand her and keep calling her strange food names as terms of endearment. Her classmates who try to befriend her, baffle her. All she wants is an expensive ($100) graphing calculator and for everyone to leave her to her thick textbooks on calculus or civil disobedience. When her classmates, who are also hopelessly misunderstood by their parents, ask for her help, she agrees. She will help if they pay her – she really wants that graphing calculator. Her plan seems foolproof. One that will help everyone get what they want. But . . . things, as they often do, turn out a little differently. Sophie’s plans involve a hilarious sit in at a ballet recital, an observant student journalist and a ring tailed lemur who (with Sophie’s help) destroys a birthday party (a poolside adventure involving diving boards, salt water taffy and grasshoppers). Lots of laughing in this book. Especially at adults and their ridiculous ways. Sophie’s teacher, Mr. St. Cupid, has more rules than you can possibly imagine and is constantly adding to his list. (No sighing! No reading books fatter than your head! No dropping three things at once!) Parents also come across as clueless. But when you are 6-9 years old (the intended audience of this book), this is pretty cool. A short read. Perfect for June! But also perfect for students wanting a great book to kick off their summer reading. Themes of resourcefulness, teamwork and friendship. This entry was posted in Uncategorized and tagged fiction, friendship, great read alouds, Jason Beene, Lisa Graff by carriegelson. Bookmark the permalink.